Vladimir Putin on Thursday appointed a firebrand nationalist politician, who oversaw Russia's once proud space industry, to manage its space agency in a move analysts said spells more trouble for the embattled sector. Over the past few years the Russian space industry has suffered a series of setbacks including the loss of a number of satellites and other spacecraft. Dmitry Rogozin, who had been widely expected to secure the appointment as head of state space agency Roscosmos, oversaw the space industry as deputy prime minister from 2011 until earlier this month. Rogozin—who was placed under US sanctions over the Ukraine crisis in 2014—lost his government post when Putin unveiled a new cabinet earlier this month. Meeting with Rogozin on the sidelines of an economic forum in Saint Petersburg on Thursday, Putin said Rogozin had "an excellent opportunity" to develop the space agency using all his earlier proposals and ideas. 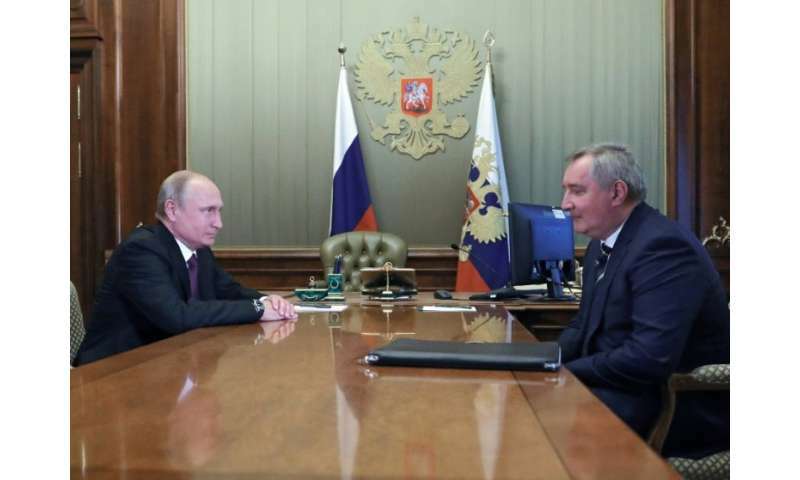 "There is a need to look into strengthening the team," Putin said, adding Rogozin had to pick experts who know the space industry from the inside including "top scientists and organisers." But many commentators said the choice of Rogozin, who previously served as Russia's NATO envoy, was a huge disservice to the industry. "Everything he says is silly from a technical point of view," independent space expert Vadim Lukashevich told AFP. "He is the head of the industry's burial party." During his years as deputy prime minister in charge of space and defence, Rogozin repeatedly raised eyebrows with his statements and behaviour. After Washington introduced sanctions against Russia over its annexation of Crimea, Rogozin said US astronauts should use trampolines instead of Russian rockets to get to the International Space Station (ISS). The two nations work side by side on the ISS, which has been in orbit since 1998. "When it comes to human spaceflights, Russia closely cooperates with the United States," said Yegorov, who is also a popular blogger. "There will be difficulties here obviously," he told AFP. Russia and the United States agreed last year to cooperate on a NASA-led project to build the first lunar space station, part of a long-term project to send humans to Mars. An international base for lunar exploration for humans and robots and a stopover for spacecraft is a leading contender to succeed the $100 billion ISS, the world's largest space project to date. Yegorov said he doubted that Rogozin would lead the Russian space agency to dazzling new achievements in deep space exploration. "The Russians' flight to the Moon is under threat," he said. "The industry will be preserved but it may lose it space ambitions." As part of his portfolio when deputy prime minister, Rogozin oversaw the construction of Russia's new spaceport in the Far East which began in 2012 but was marred by labour disputes, corruption scandals and delays. Sending the first man into space in 1961 and launching the first satellite four years earlier are among key accomplishments of the Soviet space programme and remain a major source of national pride in Russia.